With the recent addition of the welterweight tango between Dan Stittgen and Marcelo Guimaraes, the 12-bout lineup for “UFC on FUEL TV: Munoz vs. Weidman” has been completed. A critical middleweight showdown with Mark Munoz and Chris Weidman headlines the festivities. As the roster currently stands, the light heavyweight shootout between Joey Beltran and James Te Huna will serve as the co-featured attraction. 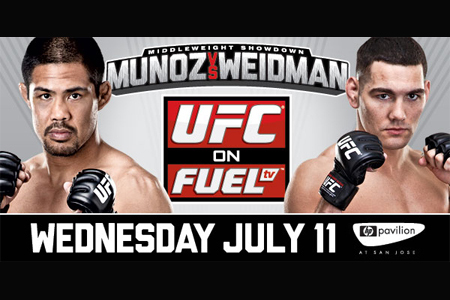 FUEL TV broadcasts the main card live beginning at 8PM ET/5PM PT. Although an official announcement hasn’t been made, the UFC’s Faceobook page is expected to offer a live stream of the night’s preliminary action. HP Pavilion in San Jose, California hosts the July 11th shindig.